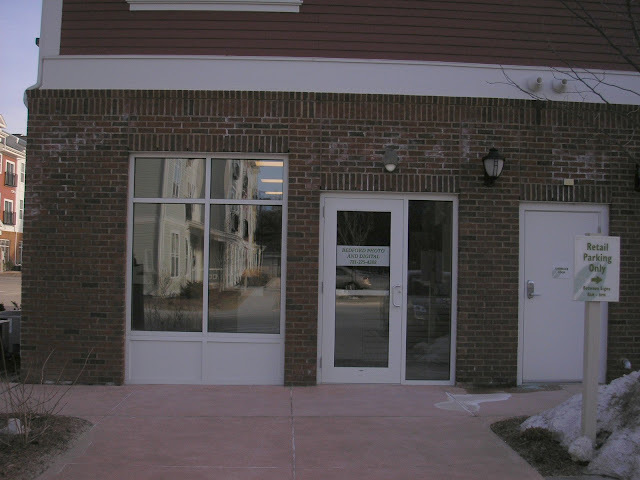 Bedford Photo and Digital, formerly located at 363 Great Road (next to D'Angelo's Grilled Sandwiches) has moved to The Village at Taylor Pond which is located at 59 Middlesex Turnpike. According to owner Tim Barrett, they moved in about 2 weeks ago. They will continue to offer their regular services and hope to attract new customers. A good portion of their customers are corporations and he hopes his location will be more convenient to a lot of nearby companies. Currently Tim has posted some temporary signs on his windows and he hopes to add a larger permanent sign above his store in the next few weeks. 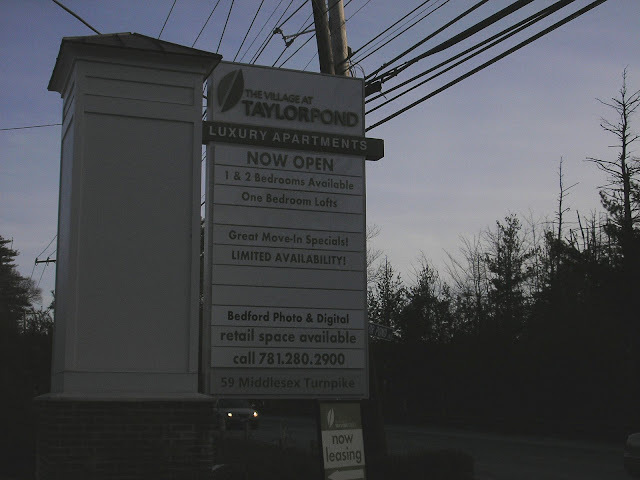 The main sign for The Village at Taylor Pond now lists Bedford Photo and Digital. The sign does not stick out on to Middlesex Turnpike, making it difficult to see until you are right on top of it. I'm guessing the sign visibility will improve once Middlesex Turnpike gets widened to 4 lanes. This is the first retail tenant at The Village at Taylor Pond which is a mixed use development with 188 apartments and about 10,000 square feet of retail space. I previously wrote about the retail space back in April 2008. A new restaurant called Lola's with available outdoor seating, was supposed to open earlier this year. It will be interesting to see how this retail area develops. Along with Taylor Pond, across the street is the fairly new Heritage at Bedford Springs which has 144 apartments plus you have the Goddard School and plenty of Office Parks nearby. The closest food/convenience store is the Mobil on Bedford Street which is about 1.2 miles away. The Village at Taylor Pond could probably support a 7-Eleven as well as a dry cleaner while restaurants would bring customers to the other businesses.